Indian Coast Guard AC 02/2019 Group 6 Result Check Here. Indian Coast Guard AC 02/2019 Group 5 Result Check Here. Indian Coast Guard AC 02/2019 Group 4 Result Check Here. Indian Coast Guard AC 02/2019 Group 3 Result Check Here. Indian Coast Guard AC 02/2019 Group 2 Result Check Here. Indian Coast Guard AC 02/2019 Group 1 Result Check Here. Indian Coast Guard 01/2019 Result Check Here. Indian Coast Guard Assistant Commandant 01/2019 Admit Card Download Here. Indian Coast Guard Notification is out. 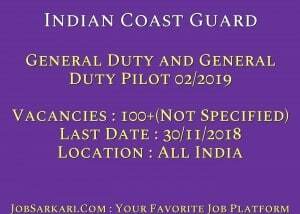 Indian Coast Guard is recruiting for 100+(Not Specified) AC 02/2019 Group 5, 6 Posts. 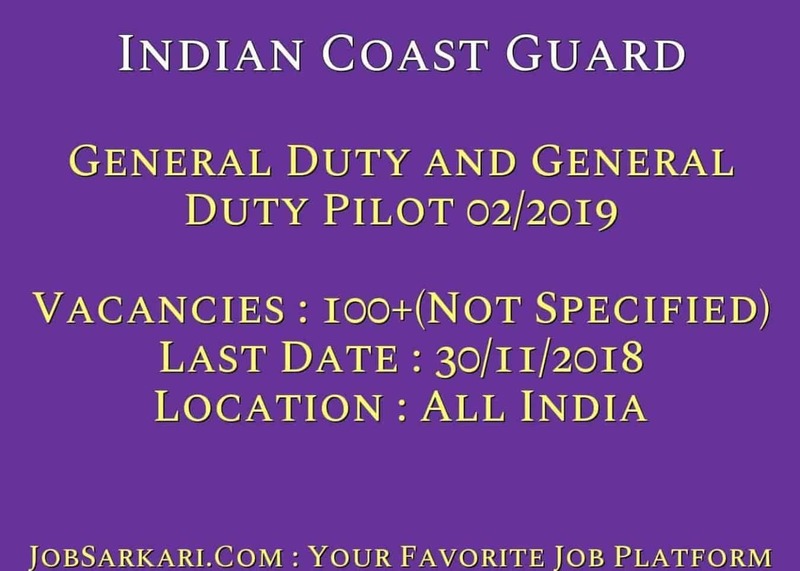 You can check Indian Coast Guard - Indian Coast Guard last date, download Indian Coast Guard notification, visit Indian Coast Guard official website and check other Indian Coast Guard Vacancy details.Complete Vacancy and recruitment Details about 100+(Not Specified) AC 02/2019 Group 5, 6 vacancies in Indian Coast Guard are provided below by JobSarkari.Com only for you. Last Date for Apply Online 30/11/2018 till 05:00 PM. Last Date to Complete the Form 30/11/2018. Download Admit Card 09/12/2018 Onwards. Date of Preliminary Examination 17/12/2018 to 17/01/2019. General Duty Candidate Must have Passed Bachelor Degree in 60% Marks with Math and Physics as a Subject Up to 12th. 01/07/1994 to 30/06/1998. 100+ Not Specified. General Duty (Pilot) Candidate Must have Passed Bachelor Degree in 60% Marks with Math and Physics as a Subject Up to 12th. 01/07/1994 to 30/06/2000. 100+ Not Specified. General Of Civil Aviation (DGCA). 01/07/1994 to 30/06/2000. 100+ Not Specified. Total No of Post 100+Not Specified. Asst Commandant (GD) 157 cms Proportionate to the Height and Age, + 10 % acceptable. Well proportionate, minimum expansion 5 cms. Asst Commandant (Pilot) and CPL holders 162.5 cms. Proportionate to the Height and Age, + 10 % acceptable. Well proportionate, minimum expansion 5 cms. 1.Preliminary Examination (Mental Ability Test/ Cognitive Aptitude Test ). 3.Candidate Need to Choose the Venue for PSB Out of the Options Displayed. 6.Online Application can be Submitted on or Before 30th November 2018 till 05:00 PM. Q. What is the Last Date For Indian Coast Guard AC 02/2019 Group 5, 6 Vacancy ? A. Last Date for Indian Coast Guard AC 02/2019 Group 5, 6 Posts is 30/11/2018. Q. What is the Form Type of Indian Coast Guard AC 02/2019 Group 5, 6 Recruitment ? A. The Form Type for Indian Coast Guard AC 02/2019 Group 5, 6 Posts is Online. Q. How many vacancies are available in Indian Coast Guard AC 02/2019 Group 5, 6 Posts ? A. There are about 100+(Not Specified) Vacancies in Indian Coast Guard AC 02/2019 Group 5, 6 Posts.